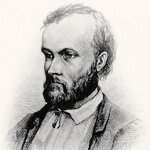 Alexis Kivi was born on October 10, 1834. While studying literature at the University of Helsinki, he got acquainted with the famous journalist, philosopher and statesman Johan Vilhelm Snellman. Kivi became interested in theater and wrote his first play, Kullervo. It was based on a tragic story from the Finnish epic Kalevala. Although Kivi created twelve plays and a collection of poetry, his most significant work is his first and only novel Seven Brothers (Seitsemän veljestä) considered the first major novel in the Finnish language. It took Kivi almost ten years to complete the work. Seven Brothers was published in 1870. This event marked the end of an era dominated by authors who wrote in Swedish and created a basis for a new generation of Finnish authors. Alexis Kivi and his successors such as Juhani Aho and Minna Canth focused on depicting ordinary people in a realistic way. Finnish Literature Day is not an official flag day, but Finns are encouraged to fly the national flag on the occasion.